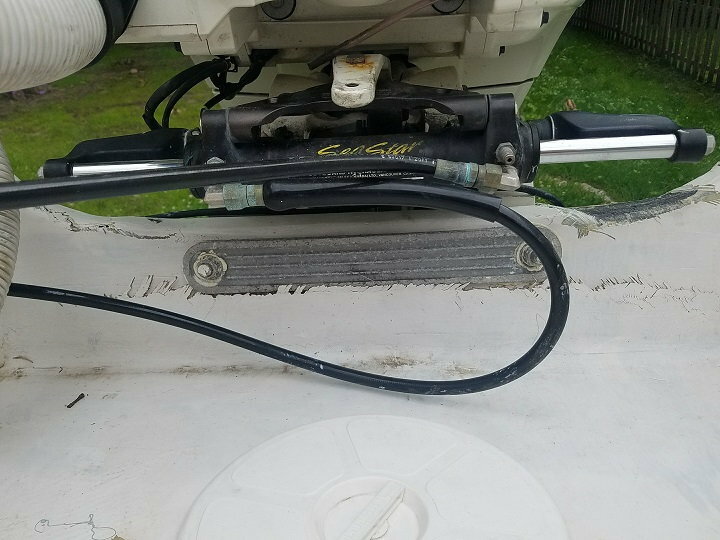 My 1991 C-Hawk 245 has a 1 year old coosa transom I installed with the help of the Hull Truth. 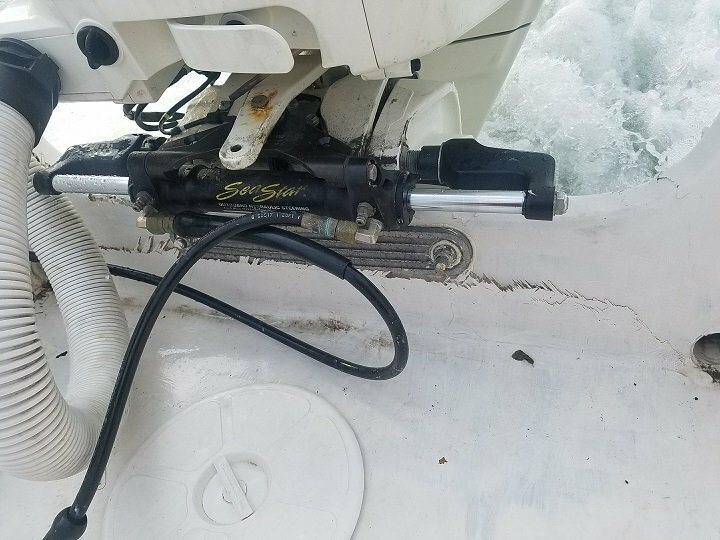 I struck a floating log offshore and did considerable damage to the transom where the motor mounts. 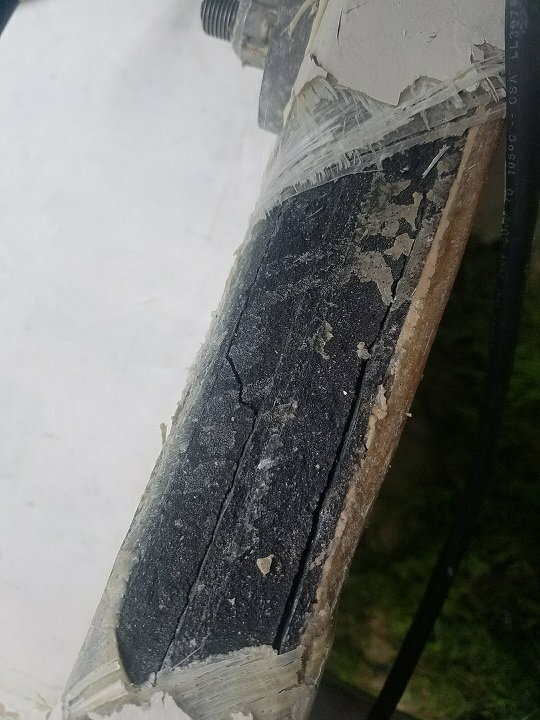 Any advice on how to repair would be appreciated. 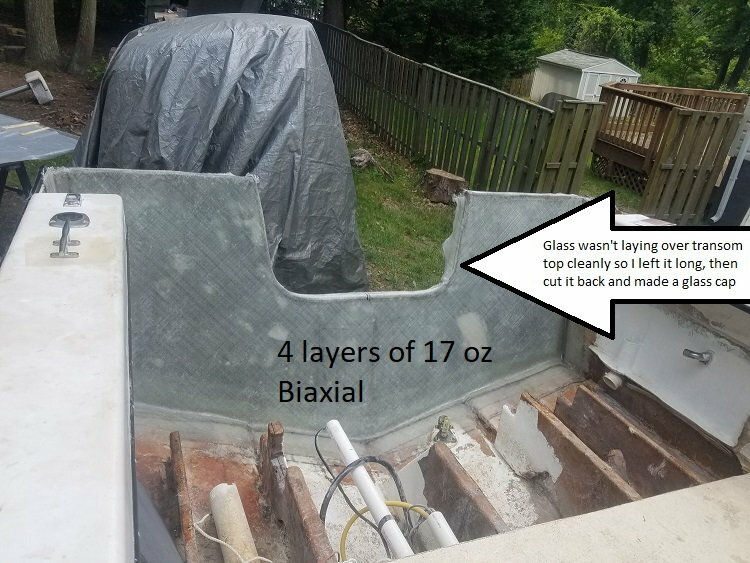 The splashwell walls are 1.5" coosa with a couple layers of 1700 biaxial over them, and tabbed into the transom as well as connecting to the main stringers, making them large gussets or knees. I don't think the transom took any damage outside this center area. With the core sheared like it is, I'd say it needs to come out and start from scratch. I was considering replacing the core between the two large knees, tabbing and glassing it to the existing knees. Then doubling their width to hold the new piece on place. I know in home construction a design like this would work. I don't know if it would create a hard spot or not. You already have a hard spot. That’s why the damage was contained between your knees. The problem is that in your proposed repair, your placing your joint at a hard spot. 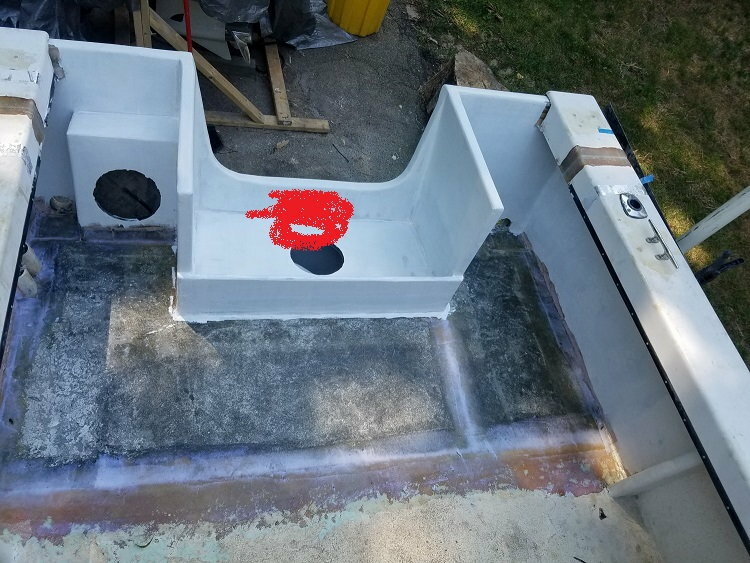 What about filling in the space between the knees as you propose, but then adding a kick out to the rear transom face that spans across your knees into clean transom. I looked for pictures of boats that have the kick out that I’m thinking of, but couldn’t find any and couldn’t think of the boats that had them. 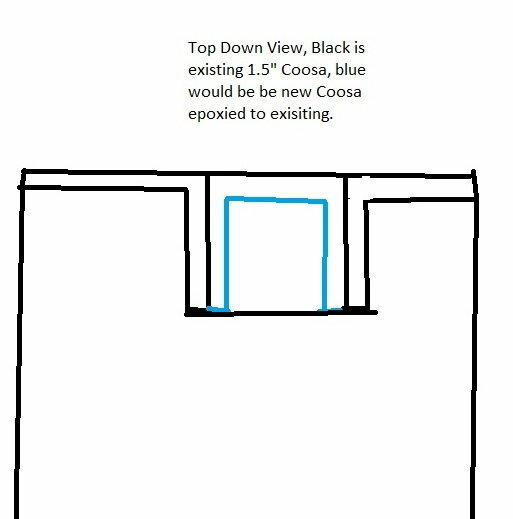 You would end up with a 5’ wide area with extra transoms thickness. Wow! So sorry to see. I'd be sick over that. I don't really have anything to offer, unfortunately. I think for peace of mind I'd take a day and some alcohol to mourn the loss of my time (and money), and then just replace the whole thing. I get guys hit some good stuff at high speeds and have not seen a transom fail that bad, especially a new one. Just curious... what happened to your Suzuki's lower unit with that impact? Sorry for your loss. 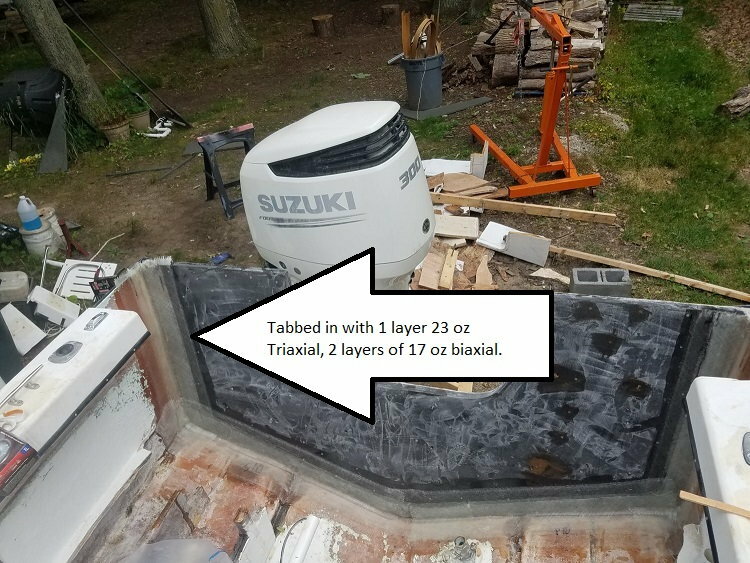 Makes me feel good about my marine plywood transom. Raybo it was like getting in a head on collision, the boat came to a dead stop. I think if I had run it aground that fast it would have been much less damage, as the impact would be spread out over a full second or two vs the instant impact. I am going to cut the whole core out between the knees at a minimum. Do you think it was a poor design or workmanship from when I built it the first time? The layup schedule was thinner than standard, but I thought it would be stronger. I realize the strength of the total laminate depends on the thickness, but I didn't think 2 inches of chopped strand, woven roven, and plywood would be stronger than 1 7/8's inches of coosa, biaxial glass, and epoxy. Fly- The suzuki lower unit almost looks untouched, all the force was transmitted to the transom. the choice of materials doesnt instantly make for a superior product, the job still relies on technique. those c-hawks usually built with mahogany plywood which is a darn good strong wood. that last pic the glass doesnt look well saturated and a good amount of air, did you roll it better after that picture was taken? I have read Gerald and others opinions of working with epoxy vs vinylester vs poly. I don't have any beliefs in the superiority of one material over another, sorry if it sounded like I did. I don't remember when exactly the picture was taken but in person the glass looked very translucent and wet out. I used Raka brand 127 series laminating resin and slow or non-blush hardener. Thank you for taking the time to look at this. Thank you. It is/was insured. I enjoy the work, I enjoy learning about it, and I get a sense of pride from doing it. I could drop it off someplace and have it fixed, insurance will cover it. I would rather take some time off from fishing and rebuild it myself. Ask me in a week when I'm covered in fiberglass dust and it's 90 degrees with 90% humidity and I might change my mind on the enjoyment part. Have your insurance fix it and be fishing in 2 weeks. Fix it yourself and hope to be fishing next spring.